The beginning of the book started with suspenseful snippets that made me want to continue reading on. The attention catching snippets that open the novel are later explained in the book. With such suspense, action and humor my attention was captured and I couldn’t wait to continue reading. I am not a true science fiction reader so I was happy to have picked a book that wasn’t too deep and serious. The character, Crazy is introduced and along comes humor that I found amusing in the beginning of the book, but as the book progress it lost its humor and turned into that kind of serious read where you have to put your thinking cap on and pay close attention so that you won’t miss any of the unveiling of the mystery. The introduction of Crazy along with his amnesia opens the suspenseful question of what happened to him to cause him to loose his memory? A visit to Crazy in the mental facility is just the start to the sequence of action. The author is very detailed in his description of action as it takes place in the book. With this being a science fiction that is a good trait to have. Giving descriptive details blow-by-blow in the beginning but as the book went on there was a lot of action scenes that became very tedious. Not a moment to rest from all the action. Often the story seemed to ramble and the plot seem stretched out, as to where it could have been resolved sooner. I got lost on what the main focus of the story was because so much was going on; the Dreads, the mirror world, wars, stolen memories, DNA, the book turned serious and the humor was a thing of the past. Dr. Kelly Allenby, Crazy’s aunt by marriage, fills in some of the blanks as to how Crazy’s memory has been erased, as well as what happened to Crazy’s family and how he ended up like he is. So the author did answer all of my questions. Crazy’s lack of fear helped him excel in the military and in being a CIA agent. 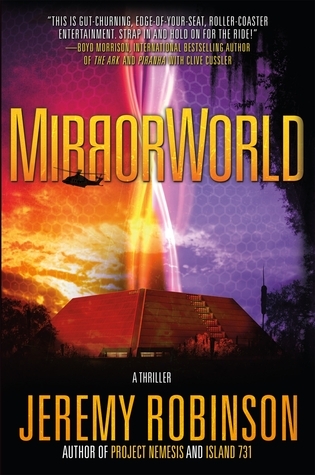 I’m not sure if it’s because the book is written in first person and there was only one main character going between worlds and doing the majority of the fighting but I lost interest in reading about Joseph (Crazy) going in and out of the Mirror World. Joseph was a little too perfect. He is ex-CIA, he was strong, smart, he had no fear, he was physically indestructible and he was the only person able to take on the Dreads. This is absolutely a talented author with an imagination that not only is able to create worlds but also has the talent to write a story where he can take his readers along in his vision. This one didn’t really win me over to where I want to start adding sci-fi literature to my reading list but I wouldn’t discourage anyone that enjoys sci-fi action thrillers. This is one I’d strongly recommend for those that enjoy a book that has suspense, and that gives the reader a story that requires them to put the pieces of the puzzle together.